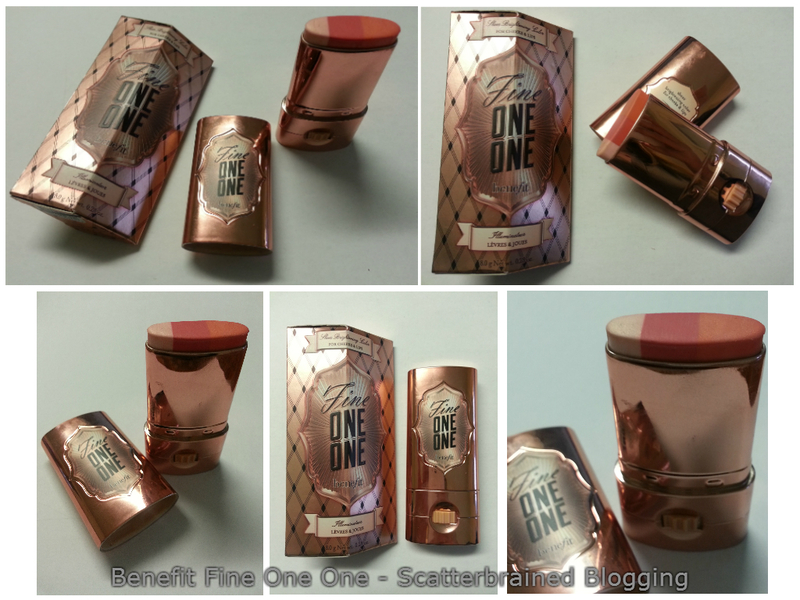 Scatterbrained Blogging: Fine One One - What's your Emergency? 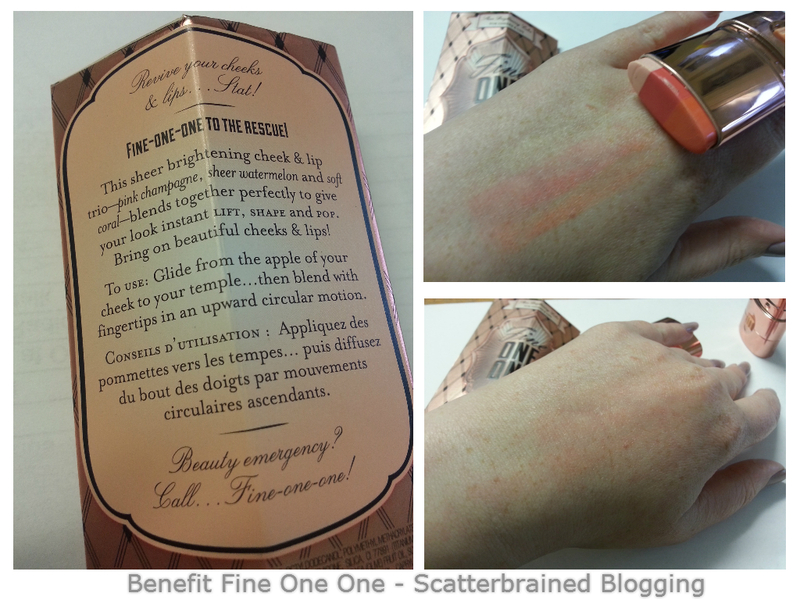 Now I'm already a huge Benefit fan, a self-confessed Benebabe. I'm all for simple, effortless beauty and this brand is more focused on enhancing everyone's natural beauty than making them look like one-dimensional, high-end clones. So of course, you may say, I'm going to think anything they release is the best thing since sliced bread; but trust me, this is a real winner. This is Fine One One, it's a cream blusher and highlighter in one that also doubles as a lip tint in a clever twist-up stick . I'm not joking when I say there were gasps echoing around the room when we were first told about it at the Benefit Christmas Blogger Meet Up. It's a cream to powder finish; it glides on, you blend it out and then it settles to be velvety soft and shimmering - rather than staying creamy and sticky. Cream-to-powder is not exactly new but having three colours in the one product is unique to Fine One One. Even on my dry skin it comes out glowing and doesn't try out or drag your foundation across your face. The colour is pigmented and build-able and the results are glowing and particularly beautiful on us Irish girls. That said, this product has been tested for years on pretty much every skin type and skin tone - it won't settle in any pores or fine lines, it's not greasy or drying and I witnessed a room of 30+ girls try it on and it looked beautiful on all of them. If like me you're that person on the bus in the mornings, bleary eyed and trying to apply makeup between red lights in an attempt to look human - this product is perfect. Gorgeous cute packaging, and a great multitasker. It's also great for travelling, festivals and those of us who just want something fuss-free but functional. Fine One One launched this weekend. It flew off the shelves in Brown Thomas, and has reportedly sold out in America. Coming in at €32 and stocked at your nearest Benefit counter. Go on and treat yourself if you ask me! Be sure to try it out in store that way not only will you leave the shop feeling great knowing you own this little gem, you'll also look great! Having poured over Spring/Summer makeup trends I'm confident in saying this product will be perfect for that minimalist glowing-skin look - a perfect companion to dewy-finish and "illuminating" foundations. Benefit have said they believe everyone has "the right to get gorgeous" - and if you need any help, it's Fine One One to rescue. Ahh I really do need to get this!! It's really unlike anything out there at the moment I think!